Blondie and Brownie: Celebrate Pi Day with Raspberry Rhubarb Pie! Happy almost Pi Day! Because March 14th (aka 3.14) should not be allowed to pass without celebrating all things pi(e), I was excited to see that this year Serious Eats and Science Blogs' are co-sponsoring a Pi Day Contest. How could I resist breaking out the rolling pin...? Update: Voting has opened, vote for my pie here! In a small bowl whisk together cornstarch and orange juice until the cornstarch is dissolved and set aside. Wash the rhubarb and trim off the edges. Cut rhubarb into 1/2-inch slices so that you have enough to fill approximately 4 cups. In a medium saucepan stir together rhubarb, sugar, cinnamon, ginger and vanilla. Cook over the mixture on moderate heat, stirring constantly, until the sugar is melted and bubbly. Add cornstarch mixture to rhubarb mixture and bring to a boil, stirring constantly. When rhubarb mixture reaches a boil stir in 2 cups of raspberries and continue simmering and stirring until rhubarb mixture becomes thick Then transfer mixture to a medium bowl, cover and chill in the refrigerator for at least 30 minutes or until the mixture is cold. 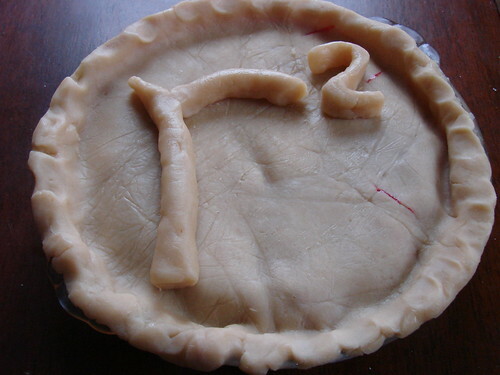 Roll out your chilled pie dough so that you have two circles. One to fit in an approximately 9.5 inch pie pan and one that will rest on top of your pie. Chill the pie shell and the rolled out top crust pre-baking for about 30-45 minutes. 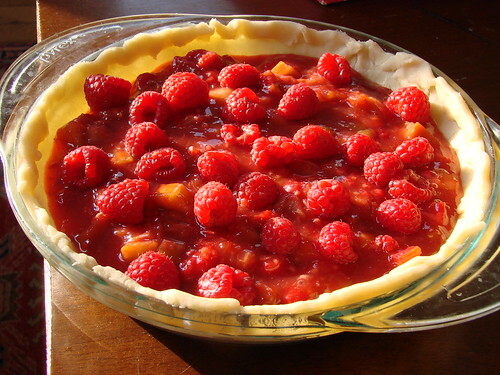 Once the crust is chilled fill it with the chilled filling, add it with the remaining 1 cup of raspberries then cover with the top crust Trim off any extra scraps from the edges and pinch the crusts together to seal the pie. Using the remaining scraps roll out a lower case r and superscript 2. Score the bottom of the cutouts and the top of the pie where you are going to place them. Brush the top of the pie with egg and sprinkle the r-squared with sugar and cinnamon, if desired. Bake for 20 minutes on a center rack in the oven, then turn the temperature down to 350°F and bake for 10 minutes more or until golden brown. Cool pie on a rack at least 1 hour to set filling. If you prefer a crumble topped pie to a double butter crust, you can't go wrong with this rendition--topped with a Chai Oatmeal Crumble (note the filling proportions are slightly less than the double crusted pie). Either version will make a fitting way to cap your Pi Day Celebration. Brownie, you have this pi day worth celebrating! Wish I could spend the afternoon baking in celebration, but I might have to settle for hitting someone in the face with a cream pie. This looks amazing! Love the math joke too! The best pi utilization I've seen! this has to be my favourite thing in the world, ever. Outstanding! My rhubarb is FINALLY peeking up through the soil in my garden! I'll have to try this recipe soon! Wow, this is looks very cute and delicious!! 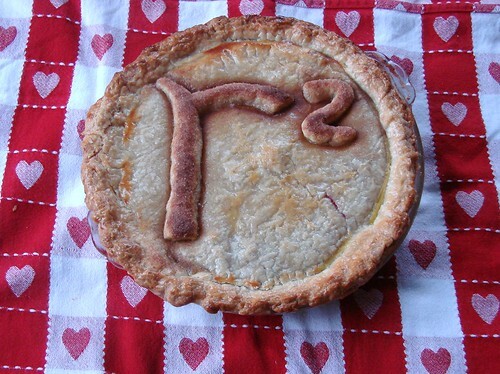 perfect for a pi day celebration! If you are big fan of baked treats, check out Baking for Good! They are an online-based store that carries brownies, cookies, and much more! Currently you can get a $50 worth of stuff for only $25! Only at www.scoop.st!